My intention was to build a one board design with low effort and a maximum of sound quality. 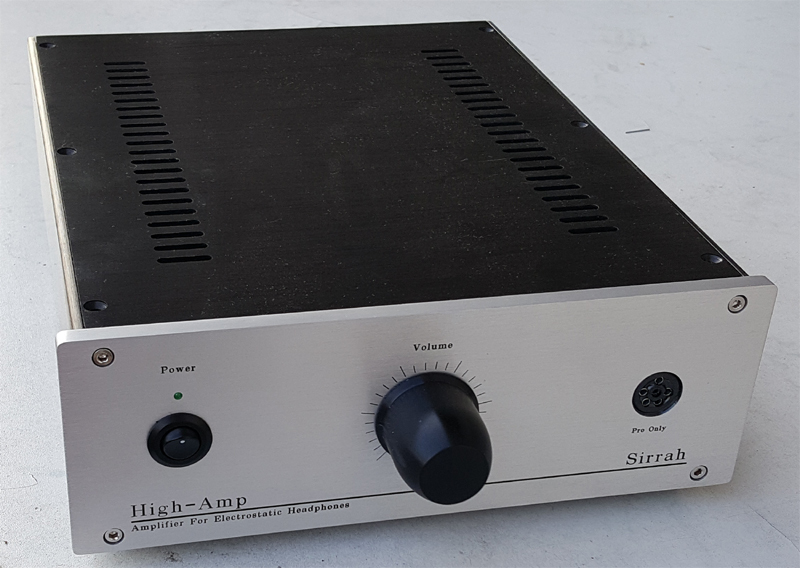 Thus the idea originated to build this amplifier, sounding on the level of the Sirius V4 with reduced output voltage. Above you see one chanel of Sirius' little brother Sirrah as a balanced DC-coupled class-A ultra high-end amplifier. Where 'little' refers to the output voltage. The input stage is a differential amplifier in cascode topology to reduce the Miller-effect. The 2SA1156 are holding a constant voltage of -24 Volt to the drains of the 2SJ74. The signal current, generated by the 2SJ74 passes the 2SA1156 and generates a voltage drop along the resistors Rx05. The voltage gain of this stage can be calclated as the quotient of 7,5k/300 = 22 (the load of the 2SC1845 not taken in account). The second stage is also a differential amplifier in cascode topology. Its gain is determined by the quotient of (220K||300K)/51, reduced by the Ube voltage drop of the 2SC1845 to 2000. The power for the output comes from the current sources Tx08, which deliver 7mA. The open loop gain is 44000, the closed loop gain is 1000, determinded by the 300k feedback resistors. The 5p silver micas are working as frequency compensation and prevent the amplifier from generating TIM. The constant current sources Tx03 draws 0,5mA from the 1,5mA, supplied by the Tx02. The +/-200V supply consists of a electronic fuse and a stabilised output, without feedback. The current source Tx03 feeds the zener diode Dx13 to generate constant 200V. The MOSFET Tx06 works as impedance converter to deliver the necessary current. To understand how the electronic fuse works, refer to the regulated power supply. Remember that you are handling with high voltages that can be dangerous to life. So if you are working on powerd on devices use only one hand in order to prevent electrical shock. Connect the input to ground and adjust the output between +Out and -Out to 0V with R57. Now connect your voltmeter to +Out and ground and use R50 to adjust it to 0V. Now repeat these two steps again. Repeat this procedure after 20 minutes when the amplifier is warmed up.The amplifier is now adjusted and ready for use. With a supply voltage of +/-200 Volt the amplifier can output more then 250 Volt eff. The power consumption of the amplifier is 30 Watt. A change of the environmental temperature of 20° C resulted in an voltage drift of 1 Volt at the output, that is nothing for an electrostatic headphone. It can drive all STAX Pro headphones (580Volt BIAS), if you reduce BIAS to 280Volt it can drive all STAX headphones. Certainly you can drive other electrostatic headphones like KOSS, Sennheiser, etc too, just fit the BIAS to the desired value. The amplifier sounds very clear and detailed. The basses are dry and strong, the frequencies at the high end are sounding very transparent. With its very fine resolution the amplifier sounds on eye level to the Sirius V4. With the 250V output voltage you can reach 110 dB sound pressure with the most Stax head phones. That corresponds to the noise of a chainsaw in 1 meter distance. 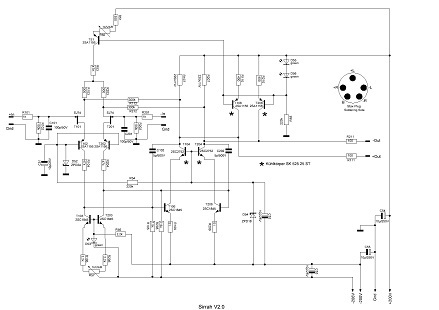 Download schematics, layout, partlist here.